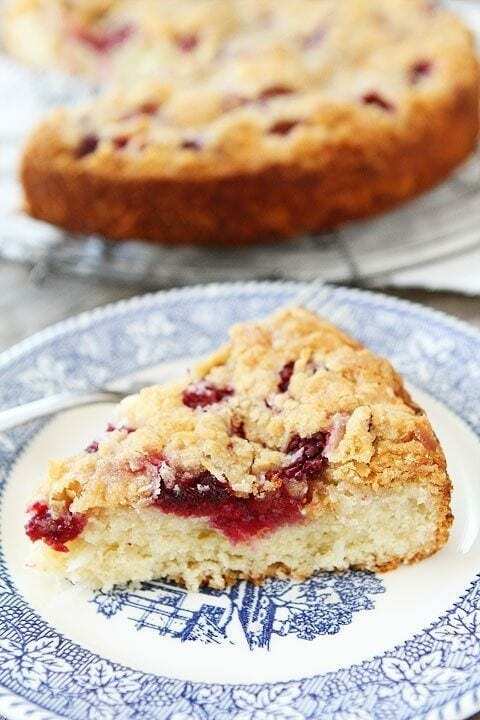 Raspberry Coconut Cake with Coconut Streusel-a simple coconut cake dotted with raspberries and topped with sweet coconut streusel. I don’t bake a lot of cakes, but I have made more than my fair share. I recently made a Raspberry Coconut Cake with Coconut Streusel and Josh said that it is the BEST cake I’ve ever made. I was kind of surprised because I just made this cake up on a whim. I wasn’t expecting it to get the BEST cake tittle. I personally don’t know if I would give it the best cake award because I am a chocolate cake kind of gal, but I will say that this cake is really, really good! It is definitely a winner! 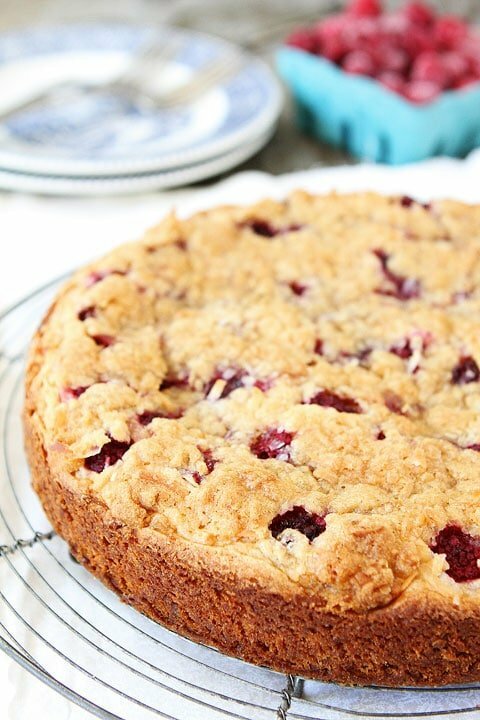 Raspberries and coconut are a match made and heaven and the perfect ingredients for a summer cake! The cake is made with coconut milk, flaked coconut, and has a coconut streusel topping so if you are a coconut lover, you are in for a real treat! Instead of using a frosting or glaze, I topped the cake with a sweet coconut streusel. The cake didn’t need anything else. The coconut streusel topping was the perfect finishing touch to my cake! I made this cake in the morning and was planning on saving it for dessert after dinner, but Josh decided he wanted a piece for breakfast. He immediately fell in love and couldn’t stop raving about my cake! He had a piece for breakfast and dessert that night:) This cake is great anytime of the day! 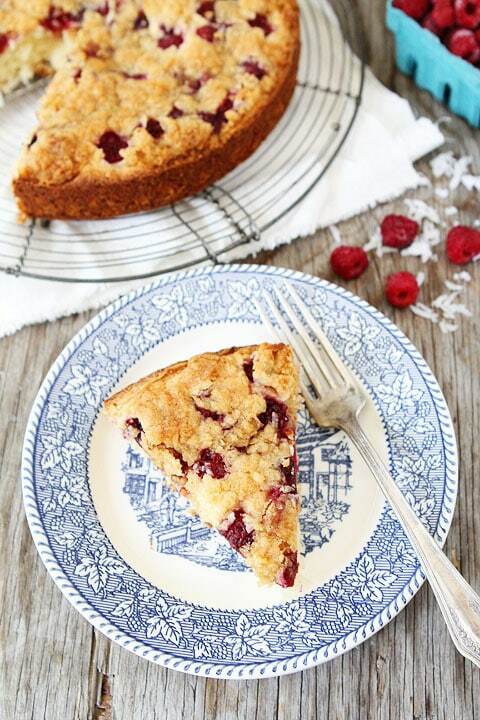 If you are looking for a simple summer cake to make, give my Raspberry Coconut Cake with Coconut Streusel a try! According to Josh, it is the BEST cake I’ve ever made! This simple cake is great for breakfast, brunch, or dessert. It is Josh's all-time favorite cake! Preheat oven to 350 degrees F. Butter a 9-inch springform pan or pie pan. Set aside. In the bowl of a stand mixer, beat the butter and sugar until pale and fluffy, about 3 minutes. Add in egg, coconut milk, vanilla, and coconut extract. Mix until combined. Gradually mix in the dry ingredients. Stir in the coconut. Transfer batter to prepared pan. Arrange raspberries on top of batter and slightly press them down. To make the coconut streusel topping, in a small bowl combine flour, brown sugar, and coconut. Add in butter pieces and mix together with your fingers until crumbly. Top the cake with coconut streusel. Bake cake for 45-50 minutes or until it is golden brown and firm to the touch. Let cool in pan for 15 minutes. Remove from pan and cool completely on a wire cooling rack. Cut into slices and server. Note-the cake will keep up to 2 days, stored in an air-tight container on the counter. Raspberries and coconut made a good combo. 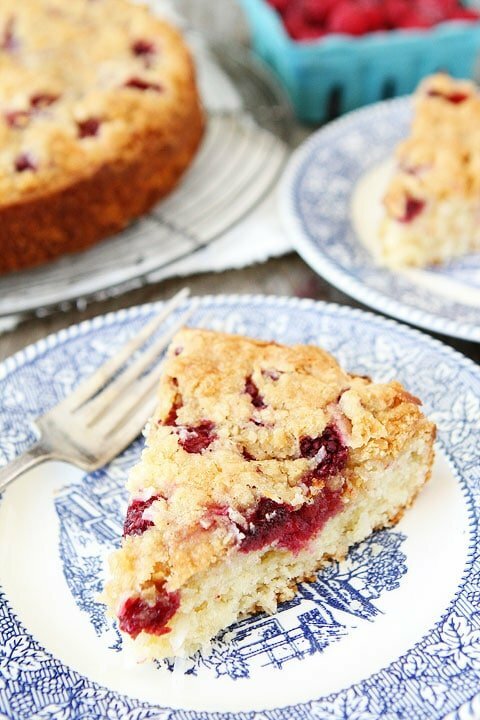 I am sure I would agree that this cake is yummylicious, especially with the coconut streusel. Thanks for sharing. I thoroughly enjoy reading your blog’s and recipes over her in England. The only problem I have is trying to convert your american measures of cups and sticks into our metric grams and millilitres!!! 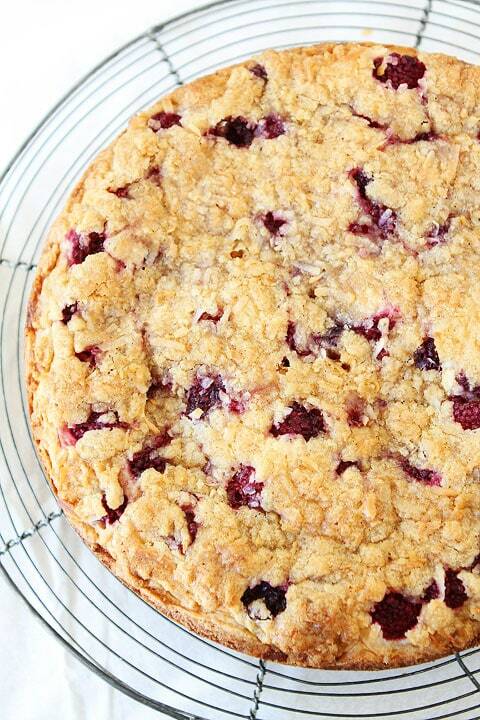 Raspberries and coconut are DEFINITELY a match made in heaven…and coconut streusel? I die. This is beautiful and sounds amazing Maria! Pinned! This sounds amaaaaazing! Isn’t it funny how “the best” is declared on recipes I never think would win that prize. Happens around here too. I want to marry this dessert? Is that legal. I’m bonkers for that raspberry/coconut combo. Spooning this up for Halloween,….hehe. Then people would never leave. Yum – love this cake. Thank you. Why have I never tried coconut streusel before? Where have I been all this time? Cake for breakfast please! Looks great! Ooooh yum!!! this looks great Maria! I make a GF vegan version of this for my family, but my husband would die for a slice of the real thing- I think I will make this for him- YUM! Love that topping and the flavors of this cake! When you say coconut milk, do you mean the stuff you buy in the dairy section (similar to almond milk), or do you mean the stuff that comes in a can in the Mexican or mixed drink section? I used canned coconut milk, but I am sure either would work in this cake! Coconut cake is one my favs! Love the raspberry addition! I’ll take a slice, please! I love the sound of that coconut streusel topping! This cake looks great Maria! A lovely cake and coconut is one of my favorite, so this is for sure being made! I adore all things coconut, so this is going on my must try list!!! love the raspberry addition to it as well. It looks so summery! I feel like everyone’s got baking fever right now! 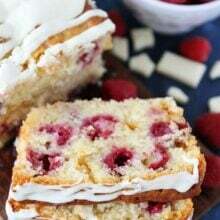 I just made a spice cake using Ginger Ale, and now I see this beautiful raspberry coconut cake! It looks lovely, great job! Coconut streusel?! Genius. This cake looks delicious! This is my kind of dessert- so gorgeous! I’m with Josh, I’d want to eat it for breakfast too. I am looking forward to making this but I cannot find coconut extract. Any suggestions for substitutions? There is nothing better than cake for breakfast! Raspberries are my favorite. Maybe because they are harder to get unless you are lucky enough to know someone with a patch. They are prolific in my part of the country. But I guess they are pricey because of their short almost non existent shelf life. I make a lot of coffee cake. So I find this recipe sublime and I pinned it. Made this for dessert tonight and it did not disappoint. Kids loved it and so did hubby and I. (Made with unsweetened coconut & served with a little spoon of vanilla ice cream.) Delicious! I’m sure I will be dreaming about this cake tonight! Can I make this into a chocolate raspberry coconut cake?? Do you think it would be good??? My sister is requesting a chocolate raspberry cake for her birthday and I saw your recipe…… I really want to make it, but I think she’s set on the chocolate part. What are your thoughts??? Thanks so much for your help!! 😀 Love your recipes and your blog, Thanks for all you do!! I made this recipe following the exact directions provided and it was absolutely divine. I served it with a little scoop of French vanilla ice cream and everyone loved it. Reminded me of “Mikado” cookies I used to eat when visiting Ireland, so thank you for bringing back such lovely memories. I will be making this again…and again…and again. A total keeper. This one is a definite winner! It looks very impressive and tastes fantastic — not overly sweet, but very flavorful — yet doesn’t take a great deal of effort. The “crust” caramelized a little bit too, and man oh man were we all swooning over it. I can’t wait to make this again and experiment with the base! Substituted gluten free flour and it was moist & delicious. 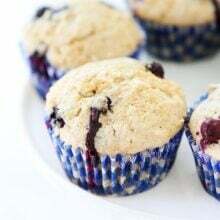 Made one with half raspberries and half blueberries, equally delicious. Glad it worked with gluten free flour! LOVELY cake! 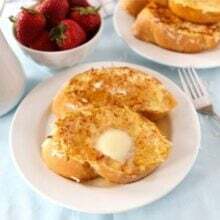 I would serve this for a brunch or bridal/baby shower because it is light and so flavorful. I also love that it is made in a pie pan! I am obsessed with raspberries so I would maybe up the amount to 1.5 cups for more tart flavor. Wondered if there could be a substitute for the coconut milk? I just hate wasting the can of milk since I used less than half. Would whole or skim milk work as well? PS, the streusel absolutely makes it!!! Buttermilk or whole milk would be fine. Enjoy! This isn’t just a summer treat. A co-worker brought this delicious dessert to share with us today. Those of us we love coconut (because you either love it or not, there’s no in between) ranted and raved about how great it is. I immediately asked for the recipe. Thankfully she shared the actual link. I am stopping for some raspberries and coconut milk on the way home tonight because I know my family will absolutely love this! Yay! I am so glad you liked the cake! Holy moly is this cake delicious! I was looking for recipes to use my glut of golden raspberries and I thought this sounded tasty and I’m so glad I made it! Absolutely delicious! 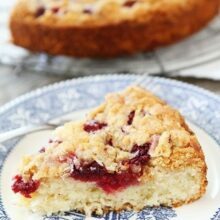 Delicate crumb, light, tasty cake and the raspberry flavor mingled in is divine, and the crispy topping is amazing! The only change I had to make (bc I didn’t have any) is I subbed a 1/2t of almond extract for the coconut extract. I didn’t want to add too much almond, but i think that amount was a great addition. Thanks for a seriously delicious recipe! I am so glad you liked the cake! It is Josh’s favorite! Can I use a dessicated coconut instead of the sweetened coconut? Also Coconut milk, do you mean coconut crème? Great recipe! I only keep unsweetened coconut on hand, and it works well. I used shredded coconut for the batter and flaked for the streusel. This cake will definitely be on rotation during raspberry season from now on. Thank you for sharing! Your husband is right! This cake is special. I’ve made this cake twice already and received rave reviews. It will definitely become one of my ‘go to’ recipes. It is not overly sweet and is very moist. It’s nice to get a contrast of the tart raspberry with the sweet cake. The streusel topping just takes it to the next level. If you love coconut, this cake will not disappoint.